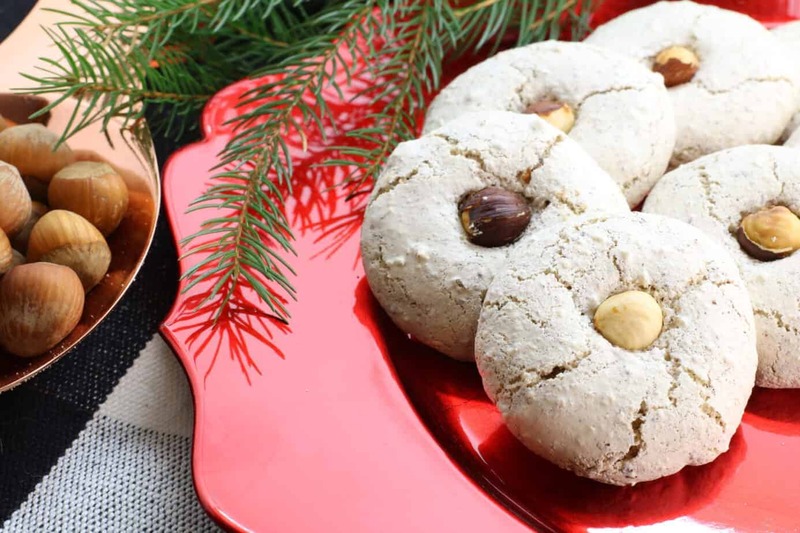 (Which she also happened to crave during her pregnancy and are incredibly difficult to find pre-made during the summer months by the way), followed by peanut butter balls. I received the same response from almost all of my co-workers who I posed the question too. While a few of them said they make some kind of secret cookie recipe with their families almost all of them said Nanaimo bars are about as traditional as it gets. How do you actually make these delicious looking treats? I’d only ever bought them pre-made or seen them at Holiday bake sales. It turns out they are surprisingly easy to make despite taking a good 40 minutes to prepare (but this is mainly due to having to chill chocolate in the fridge etc. ), so plan ahead and set an afternoon aside when making these. The fact that Nanaimo bars are a no-bake dessert, make them ideal as a side project while cooking supper in the oven. Nanaimo bars are named after the town of Nanaimo, BC where depending on who you ask you will get various answered as to the recipes heritage. The first published version of this recipe was first published in the the Nanaimo Hospital Cookbook under “chocolate squares”, and didn’t appear in print as Nanaimo bars until it was published in the Vancouver Suns Edith Adam’s Cookbook. Others say that these delicious squares were first called London fog bars and the recipe was sent with families from London as they sailed to Canada to settled in the coal town now known as Nanaimo. 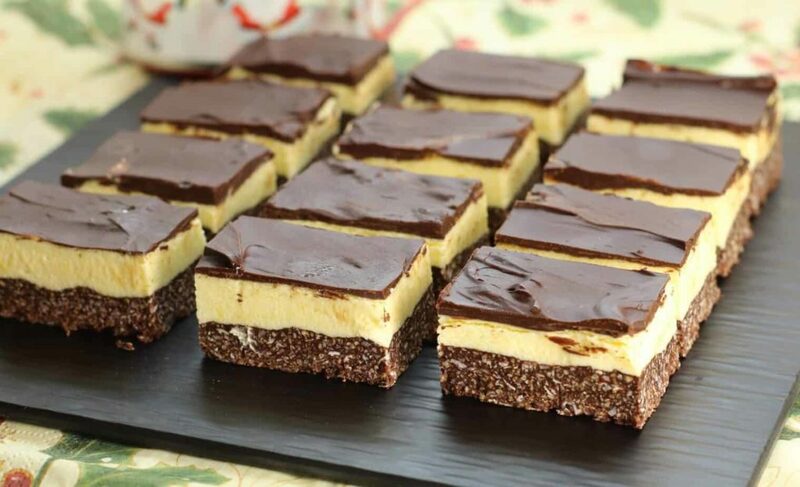 Regardless of who was actually behind the invention of this recipe, it can be said with utmost certainty that the Nanaimo Bar as we know it today is a clear Canadian delicacy. Once you have all the ingredients together, prepare a 5″ x 5″ deep cookie dish or casserole pan by lining it with parchment paper. Melt the butter, sugar, and cocoa powder in a double boiler ( a bowl set over a pot of simmering water). Once mixed together and liquid, add the almonds, graham crumbs, and coconut. If the base mixture seems too thick add some of the water to the mass to make it more pliable. You want the Nanaimo base to be mold-able yet hold together. 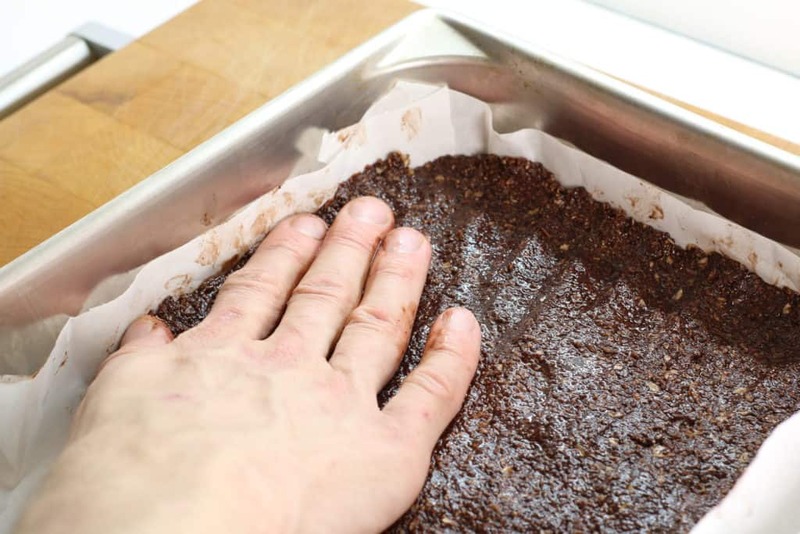 Press the base into the parchment lined pan. Chill the base in the fridge until firm, about 15 to 20 minutes. While the base is chilling, add the softened butter, icing sugar, and custard powder to an electric mixer. Beat the butter and sugar mix until creamy, fluffy and has the consistency of icing. Slowly add the 8 tbsp of whipping cream and continue beating until the cream is incorporated. The icing should be smooth and have a velvety texture. Once the graham crust base has set, use an offset spatula and spread the icing mixture evenly over the base layer. Again return the dish to the fridge to let the icing set, about 10 minutes. Melt the remaining semi-sweet chocolate and butter over the double boiler on low heat. Once the butter cream icing layer has set, pour the chocolate ganache over the Nanaimo Bars and again using an offset spatula, spread the chocolate over the top. Refrigerate one more time for at least half an hour to ensure everything is nice and cold, then cut the Nanaimo Bars into whichever shape or size you like! Looking For More Christmas Baking? 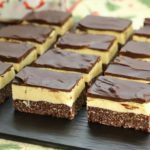 A Canadian tradition, Nanaimo Bars are a delicious holiday dessert. rich and velvety with just the right amount of chocolate. Prepare a deep cookie dish or casserole pan by lining it with parchment paper. Melt the butter, sugar, and cocoa powder in a double boiler. Once mixed together and liquid, add the almonds, graham crumbs, and coconut. If the base mixture seems too thick add some of the water to the mass to make it more pliable. You want the Nanaimo base to be mold-able yet hold together. While the base chills, add the softened butter, icing sugar, and custard powder to an electric mixer. Beat the butter and sugar mix until creamy, fluffy and has the consistency of icing. Slowly add the 8 tbsp of whipping cream and continue beating until the cream is incorporated and velvety. Once the graham crust base is firm, use an offset spatula and spread the icing mixture evenly over the base layer. Return the dish to the fridge to let the icing set, about 10 minutes. Melt the remaining semi-sweet chocolate and butter over the double boiler on low heat. 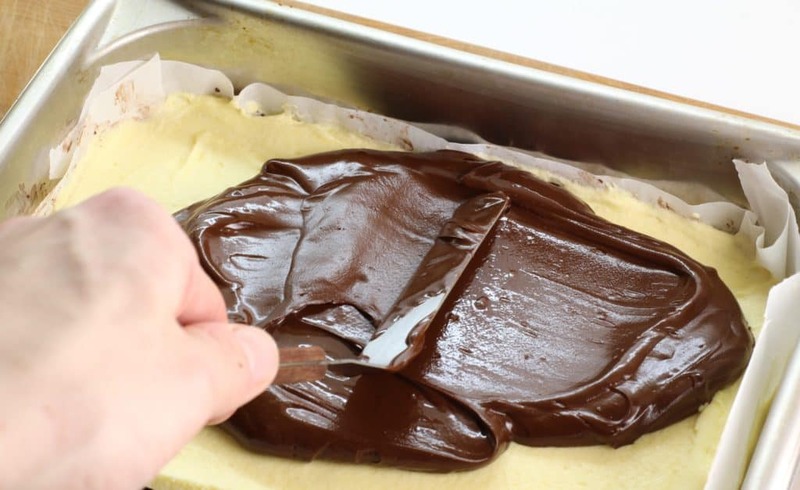 Once the icing has set in the fridge, pour the chocolate ganache over the Nanaimo Bars and using an offset spatula, spread the chocolate over the top. Refrigerate one last time for half an hour to ensure everything is nice and cold. Cut the Nanaimo Bars into whichever shape or size you like! If I’m making the bars can I use the boxed pudding powder I add cream , to make my stove top vanilla and chocolate pudding, custard?? I wanted to make them today. Icing sugar ? The canned one in the baking section? Hi Joanne, I’m not sure I am fully understanding your question. You want to use boxed pudding powder to make the custard filling? Unfortunately that wont work as the “boxed pudding powder” is not the same as custard powder, and will produce a filling that is not the correct texture or consistency. You could in theory use less liquid then the box calls for to make a thicker “pudding” but I have never done this and strongly caution against it. The main problem with boxed “pudding mix” is that it will not set solid in the fridge. You will need to use either a boxed custard filling such as Birds custard powder> which I referenced in the recipe post above, or you can make a vanilla buttercream style filling completely from scratch which will set solid (think of real cupcake icing which sets solid when cold). Do these need to be stored in the fridge, or are they okay at room temperature? Hey! The Nanaimo Bars should be stored in the fridge to keep the buttercream filling stiff. You can take them out of course to serve at room temperature but they will start to soften. I’m so excited to make these – I have never made them before and you make it sound so simple BUT I’m just reading and the list of ingredients say 8 Tbsp of whipping cream but in the method it says to add 4…….. Now I can not see where to add the other 4 OR is this just a typo (I get it because I’m the queen of typo’s lol ) but if it is which one is it?? I don’t want to add too much or not enough and what size a pan?? I need to make lots (To take to my Husband work) so would it be ok to double it?? Thank you for pointing out the discrepancy! You are correct it is a typo!. The correct amount is 8 tbsp of whipping cream. I used a 5×5 inch casserole dish to make this recipe, if you are making a big batch I would double the recipe and use a 9 x 5 inch pan. I have updated the recipe post to reflect this! Have fun make the nanaimo bars! Hi Holly, custard powder is a pre-packaged custard mix that you usually add water to to make a custard filling. 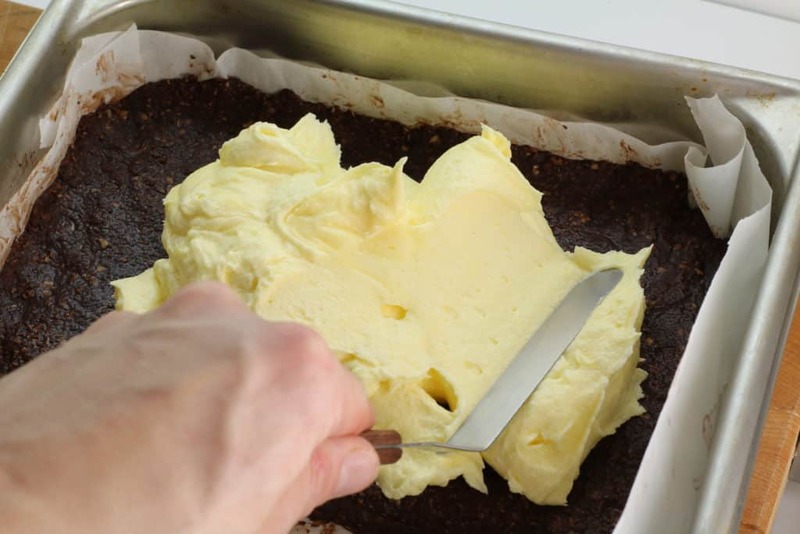 Bird’s Custard is the brand name for the original powdered, egg-free imitation custard powder, and is one of the traditional ingredients used to make nanaimo bars. These bars looks so delicious and tempting!! You have explained it so well.. can’t wait to try it for 4th of July get-together.pasty! Awesome! I would love to see a picture of yours! Take one and tag me on social media! Nice to know about nanaimo bars. They look really so tasty. I like all those flavors. I never knew about Nanaimo Bar but definitely pinning this! Really!??? It really must be a Canadian specialty! I thought they where more well known! I don’t think I have ever had the pleasure of a Canadian Nanaimo Bar, which makes me sad that I have been missing out on a delicious treat. I definitely will have to try making a batch now. You are missing out! They are so good! If you m ake these, take a picture and tag me on social media! I’d love to see your result! As close as I have lived to Canada all my life, I have never tried these bars. They look delicious and I can imagine how good they must be! That buttercream filling grabs me big time! O no! You’ll have to make a trip across the border and bring some home!, Better yet make them yourself! The recipe may seem involved, but it’s really quite straight forward. It has been a long time since I had these. They are always a hit and so delicious. Perfect for the cookie exchange too. Oh I like the idea of a cookie exchange! Great idea for next year! My mother and I were just talking about the dessert platters she and I used to make for Christmas when I was growing up. Nanaimo bars were always the first thing to disappear from the tray. It’s good to see that making these from scratch is coming back into vogue. Your recipe looks perfect and your execution is lovely! Thank you! These are always the first to disappear at my place aswell! It really is worth it! Let me know how it goes!